SPH symposium panelist George Annas, a William Fairfield Warren Distinguished Professor, suggested that that people should consider prioritizing quality of life over quantity of years lived. From anti-aging beauty regimens to strict diets and medical screenings, Western culture places immense value on the quality and preservation of life. Death, however, is a subject largely absent from daily conversation, and when raised, it evokes fear and anxiety. But talking about death—and the policies and attitudes that shape it—is a healthy practice, speakers at the School of Public Health Dean’s Symposium Death and Dying: A Population Health Perspective concluded Tuesday. 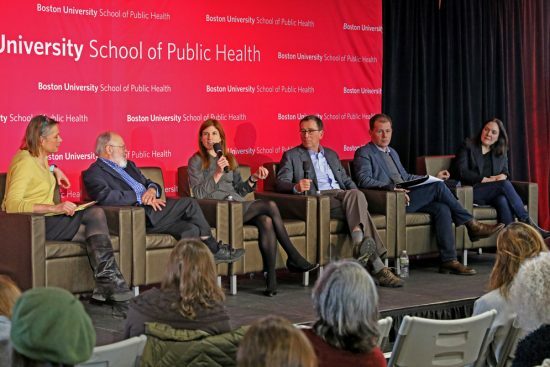 More than 150 people attended the daylong event, which gathered authors, scholars, professors, physicians, storytellers, and public health experts for a frank conversation about an inevitable part of being human. The notion of a good death—what it constitutes and if it even exists—was a central component of the day’s conversation. 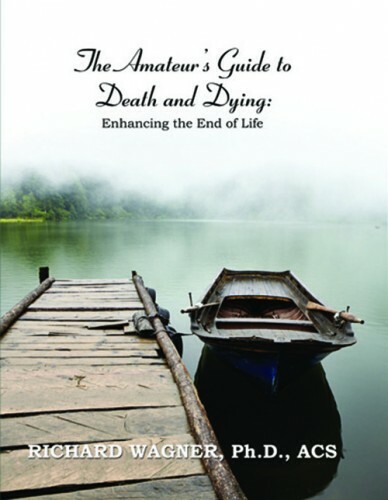 “Death and dying is an issue that is characterized by a great disconnect between the universal experience we all share witnessing the deaths of our loved ones and a reluctance to discuss honestly and publicly the policies and attitudes that have gotten in the way of ensuring the good deaths that we all no doubt seek,” said Jon Sawyer, executive director of the Pulitzer Center, which cohosted the symposium, along with BU’s College of Communication, College of Arts & Sciences Center for the Humanities, and Program for Global Health Storytelling. Sallie Tisdale, a nurse at Providence ElderPlace, pushed back against the concept of a good death. She said the National Academy of Sciences, Engineering, and Medicine definition of a good death—one that is “free from avoidable pain and suffering and in general accord with patients’ and families’ wishes”—is a fantasy. Many of the speakers’ analyses were informed by personal experience. Michael Hebb, author and founder of the Death Over Dinner movement, described how his initiative was born from a communication breakdown within his family after the death of his father. Hebb was 13, and his family members, unable to talk about the devastating loss, ate meals alone and mourned in silence. Death and Dying: A Population Health Perspective panelists Barbara Moran (COM’96), WBUR senior producing editor (from left); George Annas, a BU William Fairfield Warren Distinguished Professor; Tracy A. Balboni, Harvard Medical School; author and physician Samuel Harrington; journalist Christopher de Bellaigue; and Amy Appleford, a CAS associate professor of English. Other speakers explored ways that people can exercise some control over their own dying. “Spirituality is a primary strategy for integrating death into the human identity,” said Tracy Balboni, a Harvard Medical School associate professor of radiation oncology. Citing oncology studies conducted at four academic centers in Boston, Balboni explained that 78 percent of participating cancer patients said that religion was an important factor in dealing with their illness and that it provided coping skills and a way to understand their illness and their life. “We need a creative reintegration of spirituality into medicine in order to care for dying patients well,” she said. George Annas, a William Fairfield Warren Distinguished Professor and an SPH professor of health law, ethics, and human rights, challenged the American cultural approach that humans have to do everything they can to live as long as possible. “Avoiding death is the goal of modern medicine,” said Annas, director of the Center for Health Law, Ethics & Human Rights, arguing that people should instead consider prioritizing quality of life over quantity of years lived. 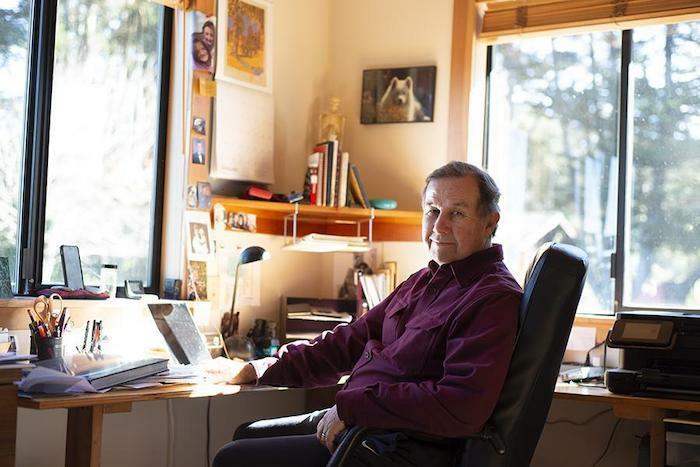 He suggested that it would be valuable to shift a portion of research funding into “things that make life worth living, such as decent housing and public transportation. “There is such a thing as dying healthy, and it can be a worthy public health goal,” Annas noted. Panelists also discussed dealing with grief after a loved one dies, and the lack of resources available to properly treat mourning family members and friends. 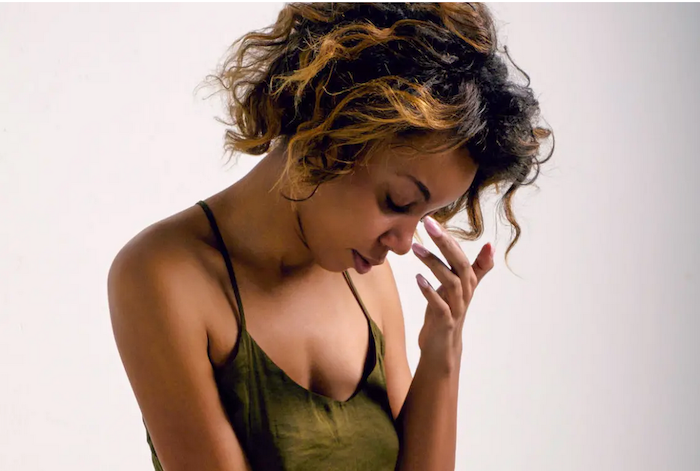 Katherine Keyes, a Columbia University Mailman School of Public Health associate professor of epidemiology and codirector of its Psychiatric Epidemiology Training Program, detailed how unexpected loss can lead to symptoms such as depression and to post-traumatic stress disorder. Afternoon session moderator Diane Gray, Acclivity Health Solutions chief innovation and advocacy officer and a board member of the Elisabeth Kübler-Ross Foundation, urged the audience to “become more engaged in the community of healing, empathetic, compassionate, caring individuals. “There is no reason in our country for us to continue the legacy of shame and stigma that surrounds grief,” Gray said. “You have to tell people how to be of support to you. You can’t just expect people to be able to know and read your mind about it,” she said. I blinked, trying to process her words. My mouth was agape because I thought I wanted to say something, anything, to refute how that statement made me feel. I opted instead to close my mouth and sit on the side of the bed, slowly sinking into the plush mattress of the hotel room we were sharing. It was early October, and I was in Charleston for the second time that year. A few months prior, I’d been devastated to learn my best friend from graduate school had been killed in a car accident. These few days I was spending in Charleston had been needed. A welcome distraction. Moments earlier I’d vented to my friend about a searing frustration of mine—feeling unsupported as I grieve and the subsequent drain. To keep a good face, I had to do the work to extend grace to friends, family, and other well-intentioned people who said unhelpful things to me regularly. It was work I had very little energy to do. What’s more, being vulnerable enough to admit to someone else how this new life reality of mine felt and being told the onus was on me was the last thing I wanted to hear. At first I was sad. Then I got really angry. So angry, in fact, that by the end of the next month I stopped reaching out to this friend for months. I was so incensed it led to a seething rage. Rage that became characteristic of much during the beginning of my grieving journey. 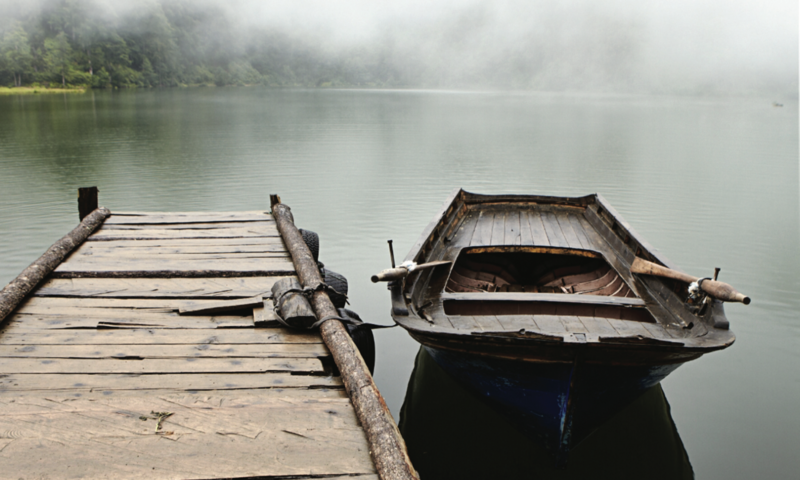 The night I’d found out Precious had died, I was alone in a fancy hotel room in Bogotá. Those first few hours of knowing she was no longer alive I’d spent in a transcendental daze. I paced back and forth in that fancy hotel room devoid of any warmth. I called my mother because I didn’t know who else to tell. Didn’t know who else could possibly understand. Who would know what to say in response to me being devastated about their best friend randomly dying at 30 years old? “Well, you know, everything happens for a reason,” she said. I paused and delicately changed the subject and then made up an excuse to get off the phone. That was the first time I remember and could identify how it felt to be angry while being held captive to grief—hands tingling like they had fallen asleep, my face blazing and on fire, my chest constricted and heavy. I’d let that instance go and buried it in my psyche. But there are so many other instances that followed in those first few months to make me more enraged. Several friends ghosted me, not bothering to acknowledge my friend’s death. Not even a blanket “I’m sorry for your loss” uttered to me. To this day, I haven’t heard from them. The abandonment and loud silence angered me. Other friends talked to me in a business-as-usual tone, unloading what I viewed as frivolous details about happenings in their lives. I didn’t have the capacity to entertain it all. The insensitivity angered me. And there were the friends and people who really tried, who said on the surface things that were kind and should’ve comforted me yet didn’t. The “She’d be proud of you” and “Do something to honor her” and the copious heart emojis or offers of hugs whenever I vented online. The fact that nothing placated me was my ultimate source of rage—one I returned to time and time again until it dawned on me that perhaps my anger was showing me something bigger than I had originally thought. Western society and culture tells you how you should grieve. It’s insidious and subtle, but the instructions and latent expectations are there. Grieve quietly and in private. Expect people to feel sorry for you and feel comforted in their sympathy. Know that people will only care up until the funeral or memorial service; then they’ll continue on with their own lives. Be gracious with people’s verbal fumblings, the empty phrases, and the Hallmark cards offered up. There isn’t room for anything other than sadness. Especially not anger. But those who are bereaved, as I learned, can be really angry. Because I lacked the support and understanding I needed as I grieved and grieved mostly alone, I turned to online resources and message boards. I scrolled through hundreds of topics and messages daily, ritualistically, from people who found themselves in this new grieving club as I now was. Anger was one of the things I saw talked about the most. Anger and frustration most didn’t feel comfortable feeling, let alone expressing to those around them. I felt vindicated knowing I wasn’t alone but also at a loss for what to do next. My anger manifested in an abject form of isolation. I pushed a lot of people away. I cut others off. I wasn’t vaguely interested in making any new friends. Most of it felt warranted at the time. Other parts were grief and sadness with nowhere else to go. My rage helped me to feel connected to my friend. If I wasn’t seething about the sucky hand I had been dealt, who was I? And if I did disconnect from it, would it mean disconnecting from Precious and forgetting her? The fear of that kept me locked into being mad and perpetually ruminating on all the ways I had been wronged. The reality of anger never gets any airtime in our culture. Anger is a response to a sense of injustice. Of course you’re angry; whatever has happened to you is unjust. Anger, allowed expression, is simply energy. Shown respect and given room, anger tells a story of love and connection and longing for what is lost. Contrary to pop psychology and the medical model, anger is healthy, normal, and necessary. I remember crying when I read those words. I felt seen in a way that I had yet to feel aside from my scrolling on bereavement message boards and grief websites. But I also felt this levity that I could accept my anger as a by-product of loss. I had every right to be angry about losing Precious and all the things I had lost as a result of her death. What human wouldn’t be mad about having to scramble to feel some sort of normalcy when their sense of groundedness is taken from underneath them so tragically? My anger was OK. It was not some black sheep of the heart making me a shameful person. How I had been coping with grief was the best way I knew how. Almost eight months after Precious died, I found a therapist. Having the support of a licensed professional eased a lot of my anxieties but also gave me a new perspective on viewing how angry I had been. Grief, loss, and death affects everyone differently. For me, I channeled all my feeling into rage because it made me feel more in control to cut people off, push others away, and isolate as a form of self-protection. Anger had been my way of feeling less of a mess in unthinkable, devastating circumstances. Looking back, as I approach the second year I celebrate Precious’ birthday after her death, I see my anger now as purposeful. 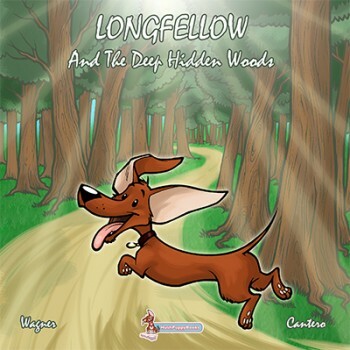 It was my process of getting to the heart of how loss affected me on a deep soul level. And I’d encourage anyone grieving to open themselves up to feeling the anger and befriending it. Not shying away from how strong it may be when it is expressed. Anger, like so many emotions, has something to teach us. And if you’re like me, feeling your ire just may facilitate in your healing. Alexis Flemming has dedicated herself to giving terminally ill animals the best last days of their lives – despite recently almost dying herself. 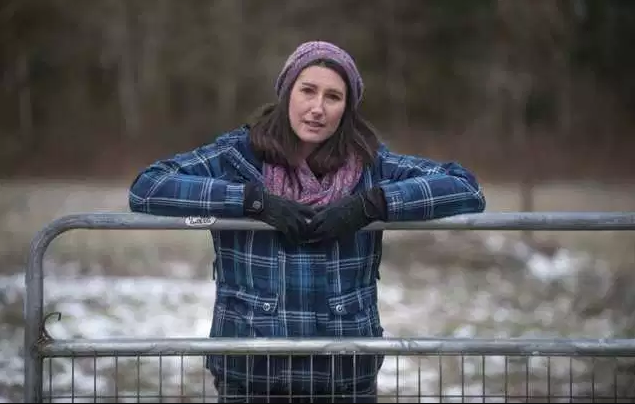 The animal lover, who lives with autoimmune diseases, was recently given only a few days to live before an operation helped control her condition. 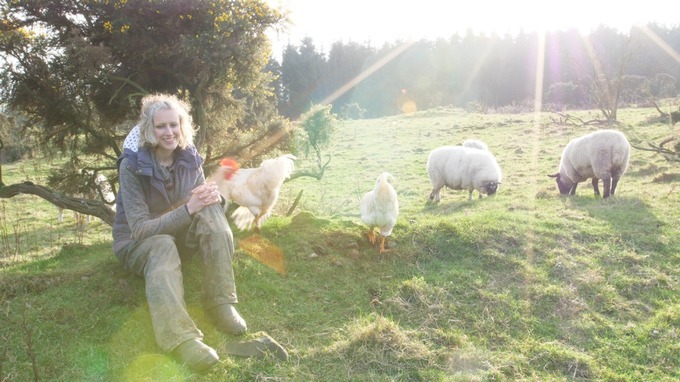 Now recovering, she is back giving care to the variety of animals she has taken in at her animal hospice and sanctuary in Scotland. She was inspired to set up the Maggie Flemming Animal Hospice in 2016 after her beloved bullmastiff Maggie died suddenly at the vets. 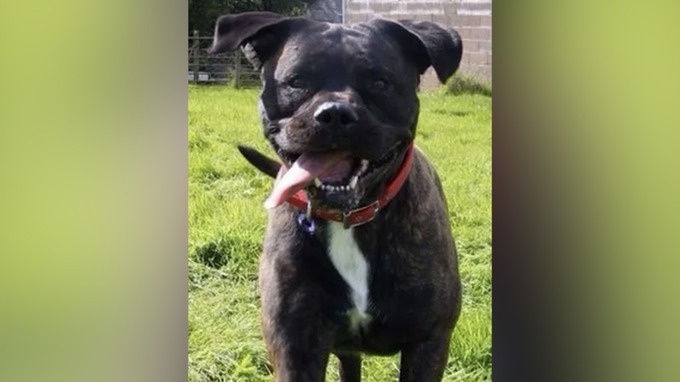 Alexis’s beloved bullmastiff Maggie died while away from her at the vets in 2016. “Not being able to be with someone you love when they die can be quite traumatic,” she says. As she walks through the sanctuary to the hospice, she knows every pig, sheep and chicken by name. She wants all the animals to have a dignified end. “They come here to spend however long they have left, a few days, a few weeks – sometimes even a few years – and I do end-of-life care to give them peace, comfort and friendship,” she says. Alexis works hard to see which activities the animals enjoy most. At the hospice, situated just outside Kirkcudbright in Dumfries and Galloway, Alexis makes a point of discovering what the animals like. For some it’s sweets and reading. For her 19-year-old pal Bran, it’s adventures in the car. 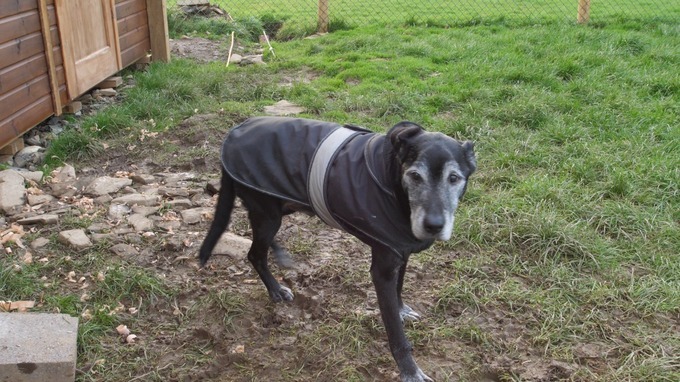 “Bran was dumped on the street when he was about 17, he had a tumour on his spleen. Bran came to us with just six weeks to live and that was two and a half years ago,” she explains. Bran is still going strong at 19, defying the terminal prediction of vets two years ago. Bran is still going strong but Alexis admits her own health problems have made it harder to keep up with the care demands. “It’s very hard to deal with that much grief. There was a time last year when I did 10 end-of-life cares in one month, that really took its toll. I was really ill at the end of that because my health isn’t very good anyway,” she says. Inevitably her own recent doomed diagnosis – while thankfully avoided – has made her re-evaluate her life and work. Bran enjoys a new lease of life, after being taken in by Alexis, that involves adventures out in the car. “I almost died twice. Even if you think you’re the most life-grabbing, go-getting person, when you’re told you’ve only got a few days left and you survive that, every day is just… you make the most of it,” she says. 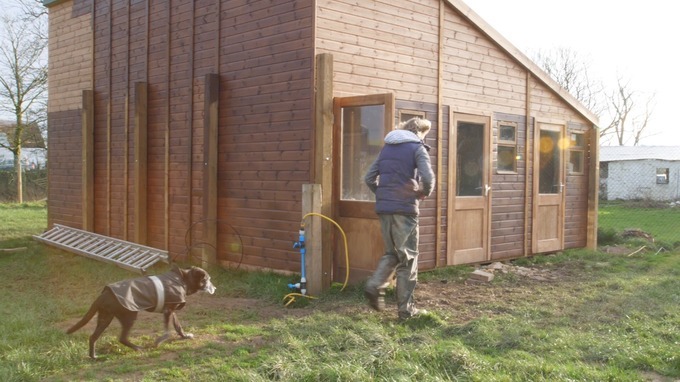 She is now developing what is the first purpose-built animal hospice in the UK. She believes it could be one of the first of its kind in the world. “We try to never turn anyone away if we can help it, but it’s very important to do end-of-life care properly, so we have very small numbers [and] we only do end-of-life for three animals at any time,” she says. The passionate animals rights advocate believes “most animals in our society are denied a peaceful life and death”. But she says she remains focused on helping the animals living out their final days in her care. From the peaks of the Blue Ridge and the Great Smoky Mountains, to the river valleys of the French Broad and Catawba, North Carolina has a long history that is steeped in rich Appalachian traditions. Despite the Hollywood “hillbilly” stereotype, Appalachians carry a sense of pride for their culture, language, and heritage. Isolated from the outside world, Appalachian regions have long struggled with rough rocky terrain for farming and plagued with poverty. Immigrants from Europe began migrating to the area in the 18th century with a large proportion of the population being Ulster Scots and Scotch-Irish. Many pioneers moved into areas largely separated from civilization by high mountain ridges and our pioneer ancestors were rugged, self-sufficient and brought many traditions from the Celtic Old World that is still a part of Appalachian culture today. 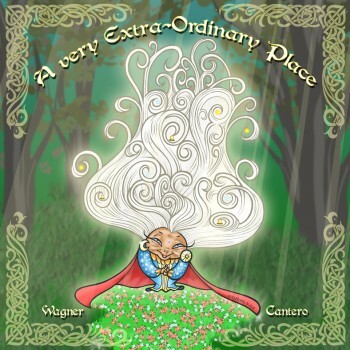 There was always a granny witch to call on when someone was sick and needed special magic for healing. Superstitions about death were common and were considered God’s will. One thing for sure, no matter how hard you fought it, death always won. Appalachian folks are no stranger to death. For the Dark Horseman visited so frequently, houses were made with two front doors. One door was used for happy visits and the other door, known as the funeral door, would open into the deathwatch room for sitting up with the dead. Prior to the commercialization of the funeral industry, funeral homes and public cemeteries were virtually nonexistent in the early days of the Appalachian settlers. In small Appalachian villages, the local church bell would toll to alert others a death has occurred. Depending on the age of the deceased, the church bell would chime once for every year of their life they had lived on this earth. Family and friends quickly stop what they were doing and gather at the deceased family’s homestead to comfort loved ones. Women in the community would bring food as the immediate family would make funeral preparations for burial. The men would leave their fields to meet together and dig a hole for the grave and the local carpenter would build a coffin based on the deceased loved one’s body measurements. Due to the rocky terrain, sometimes dynamite was used to clear enough rock for the body to be buried. Coffins used to be made from trunks of trees called “tree coffins”. Over time, pine boxes replaced the tree coffins. They were lined with cloth usually made from cotton, linen or silk and the outside of the coffin was covered in black material. If a person died in the winter, the ground would be too frozen to dig a grave. In this case, the dead would simply be placed in a protected area outdoors until spring. After the bell tolls, every mirror in the home would be draped with dark cloth and curtains would be closed. It was believed that by covering the mirror, a returning spirit could not use the looking glass as a portal and would cross over into their new life. The swinging hands on the clock were stopped not only to record the time of death, but it was believed that when a person died, time stood still for them. Before the use of embalming, the burial would be the next day since there were no means of preserving the body. To prepare the body, the deceased would be “laid out” and remained in the home until burial. The body would be placed on a cooling board or “laying out” board. Depending on the family, the “laying out” board might be a door taken off the hinges, a table, ironing board or piece of lumber. Many families had a specific board for the purpose of laying out the body that had been passed down from generations. The “laying out” board would then be placed on two chairs or sawhorses so the body could be stretched out straight. Depending on what position the person was in when they died, sometimes it was necessary to break bones or soak parts of the body in warm water to get the corpse flat on the board. As rigor mortis began to set in, some folks have actually heard bones cracking and breaking which would cause the corpse to move as it began to stiffen. The board would then be covered with a sheet and a rope was used to tie the body down to keep it straight and to prevent it from suddenly jerking upright. Post-mortem picture of the body placed on a cooling board or “laying out” board. Scottish traditions used the process of saining which is a practice of blessing and protecting the body. Saining was performed by the oldest woman in the family. The family member would light a candle and wave it over the corpse three times. Three handfuls of salt were put into a wooden bowl and placed on the body’s chest to prevent the corpse from rising unexpectedly. Once the body was laid out, their arms were folded across the chest and legs brought together and tied near the feet. A handkerchief was tied under the chin and over the head to keep the corpse’s mouth from opening. To prevent discoloration of the skin, a towel was soaked in soda water and placed over the face until time for viewing. Aspirin and water were also used sometimes to prevent the dead from darkening. If the loved one died with their eyes open, weights or coins were placed over the eyes to close them. Silver coins or 50 cent pieces were used instead of pennies because the copper would turn the skin green. Once the corpse was in place, the body would then be washed with warm soap and water. Then family members would dress the loved one in their best attire which was usually already picked out by the person before they passed. The body of the dead is never left alone until it was time to take the deceased for burial. After the body has been prepared, the body is placed in the handmade coffin for viewing and placed in the parlor or funeral room. 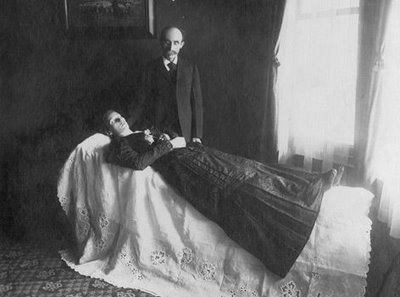 The custom of “sitting up with the dead” is also called a “Wake”. Most times a handmade quilt would be placed over the body along with flowers and herbs. 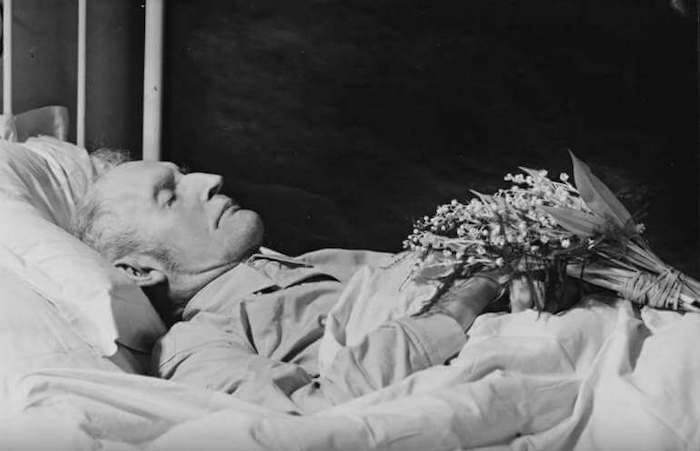 The ritual of sending flowers to a funeral came from this very old tradition. The aroma from the profusion of flowers around the deceased helped mask the odor of decomposition. Flowers as a form of grave decoration were not widely used in the United States until after the mid-nineteenth century. In the Southern Appalachians, traditional grave decorations included personal effects, toys, and other items such as shells, rocks, and pottery sherds. Bunches of wildflowers and weeds, homemade plant or vegetable wreaths, and crepe paper flowers gradually attained popularity later in the nineteenth century. Placing formal flower arrangements on graves was gradually incorporated into traditional decoration day events in the twentieth century. 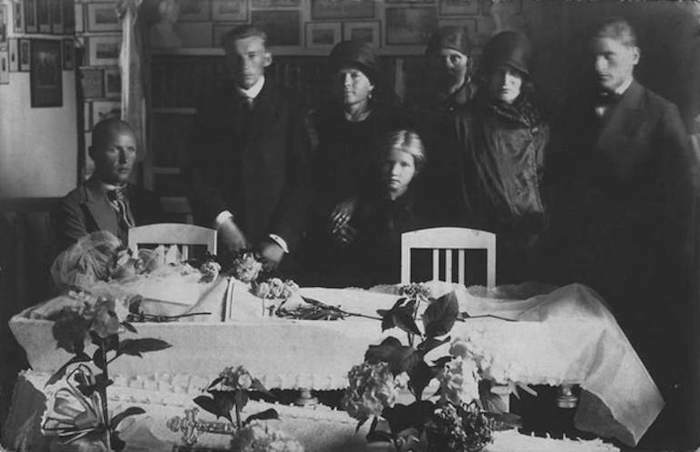 Family members “Sitting Up” with the dead in the parlor or funeral room. The day after the Wake, the body would be loaded into a wagon and taken to the church for the funeral service. Family and friends walked behind the wagon all dressed in black. The church bell would toll until the casket was brought into the church. This would be the last viewing as friends and family walked past the casket to take a final look at the body. Some would place a variety of objects in the coffin such as jewelry, tobacco, pipes, toys, a bible and every once in an alcoholic beverage. Today, a strong sense of community continues to dominate Appalachian burial customs even though the modern funeral industry has changed the customs slightly. The social dimension has changed completely since caskets are commercially produced and graves are seldom dug by hand. Modern funeral homes have made the task of burial more convenient but the downside is there is less personal involvement. Personalized care for the dead is an important aspect of family and community life in Appalachia. 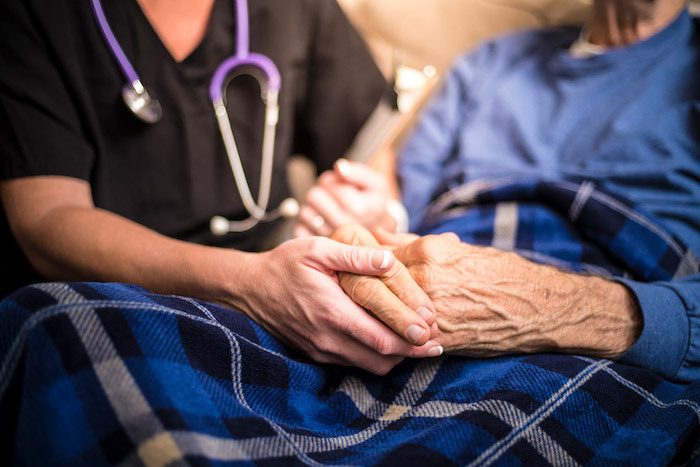 And we can certainly say for sure that the days of conducting the entire procedure necessary to bury a person, all done by caring neighbors, with no charge involved, are no longer practiced. How can we deal with death better? Lisa Hartley is a ‘celebrant’ who officiates at weddings as well as funerals. 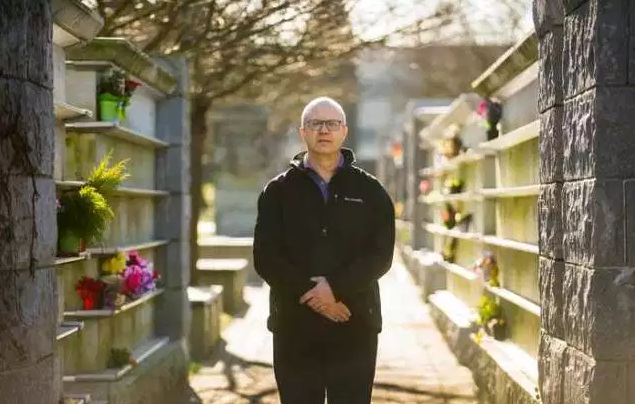 The average traditional funeral in Canada costs $10,000, according to Stephen Garrett of the Memorial Society of B.C., and GoFundMe counts funerals among its fastest-growing fundraising categories. Hartley was deeply moved by the experience, and now works closely with Davis and other alternative providers as a funeral celebrant. “My special interest is in sustainability in death care,” says Hartley. That means being more hands-on, in DIY and home funerals. 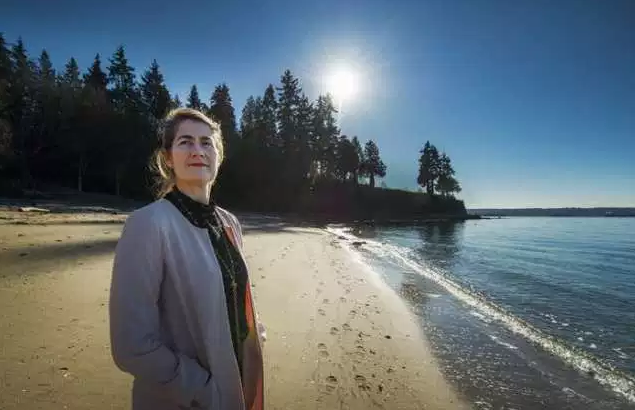 Jennifer Mallmes is a death doula who founded the End-of-Life Doula program at Douglas College. Glen Hodges is the manager at Mountain View Cemetery in Vancouver. 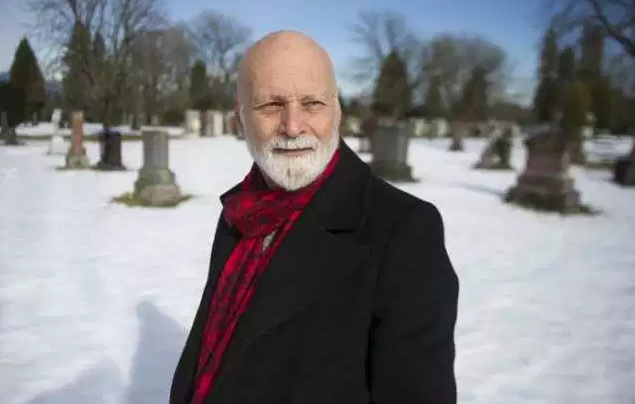 Stephen Garrett, seen here at Mountain View Cemetery in Vancouver, is the executive-director of the Memorial Society of British Columbia. 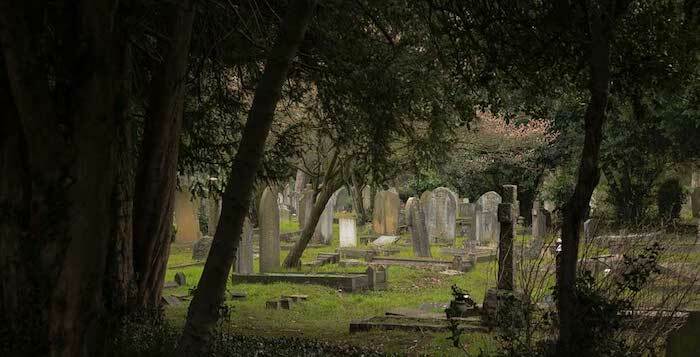 Toxic cemeteries are contributing to early deaths but examining the history of burial practices can teach us to live better. 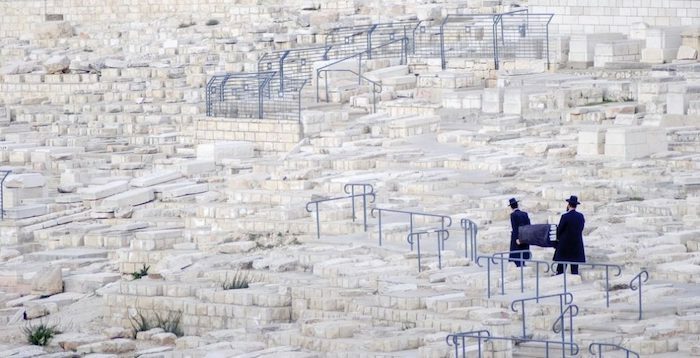 Jerusalem’s ancient Mount of Olives cemetery buries texts and objects which cannot be destroyed. 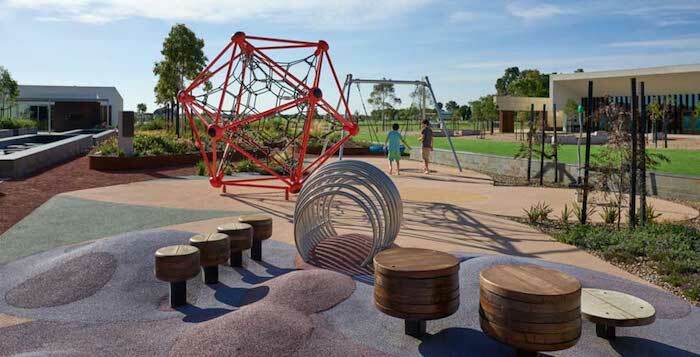 The local ecology of the Cumberland plains will be enhanced and protected. 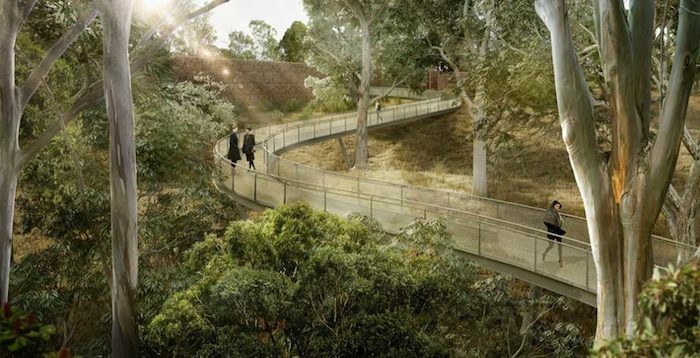 Aspect Studios design for Bunurong Memorial Park enhances biodiversity as well as social diversity, providing for multiple community open space activities much like 19th century garden cemeteries.